So, when I picked this book up from the sale bin at my local indy bookstore (Schuler’s in Okemos! Hi, guys!) 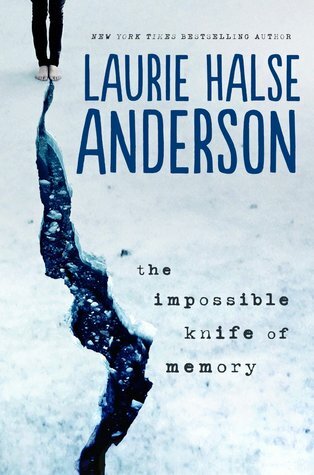 I had no idea that Laurie Halse Anderson is evidently some kind of a super-well-known YA author who tackles contemporary and controversial topics. Better late than never, I say, if my introduction to the author is through her scary and sweet fifth novel, The Impossible Knife of Memory. She illuminates Andy Kincaid’s post-traumatic stress disorder by putting the spotlight on his 17-year-old daughter, Hayley. Hayley’s a pretty bright and articulate girl, but not well-socialized, thanks to spending the last few years driving cross country with her dad’s rig, home schooled on the road. They’ve come back to their home town so that Hayley can have a normal senior year and transition into a normal life. But it’s tough to focus on fitting in when money is scarce and Dad seems to be falling apart. She makes a friend – Gracie – but can’t really open up to her. Then she finds Finn, a great guy whose family has its own secret stress and sorrow, and they help each other. Both Andy and Hayley have memory problems… Andy, who struggles to cope with horrific memories of Iraq and Afghanistan and Hayley, who has blocked off whole chunks of her past and struggles to recall the truth. She soon finds that there is no “the” truth, but that other people’s truth can be just as real as her own. Thank heavens. It’s a complicated topic, they’re complicated characters, and they deserve their complicated-but-still-hopeful-and-definitely happier ending. It’s a great read, Hayley has a real and powerful voice, and the few chapters told from her father’s POV are realistically harrowing. A definite thumbs up from me. It’s just out in paperback, so well-worth an Amazon visit. And if you’d like to read more about the Anderson and her perspective on dealing with troubling issues, there’s a good interview with her on Entertainment Weekly‘s site, where she explains why it’s important to leave issues unresolved. I was interested to see that Anderson has written several previous books, including Speak, Catalyst, Prom, Twisted, and Wintergirls, which explore other contemporary themes. I’ll be exploring that backlist! This entry was posted in Review and tagged Laurie Halse Anderson, post-traumatic stress disorder, Review, The Impossible Knife of Memory. Bookmark the permalink.